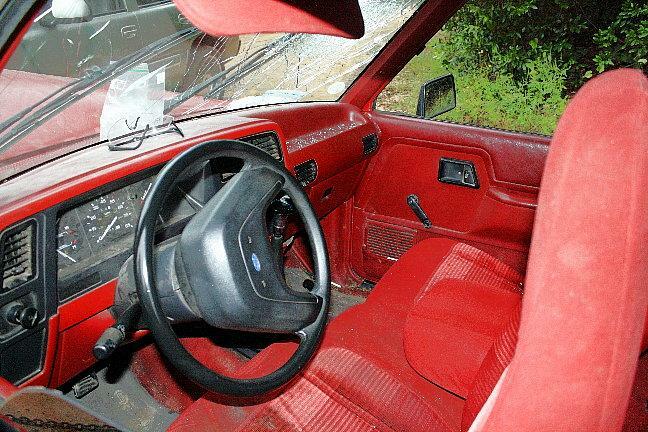 A passenger's head hit the windshield of this 1990 Ford Ranger. 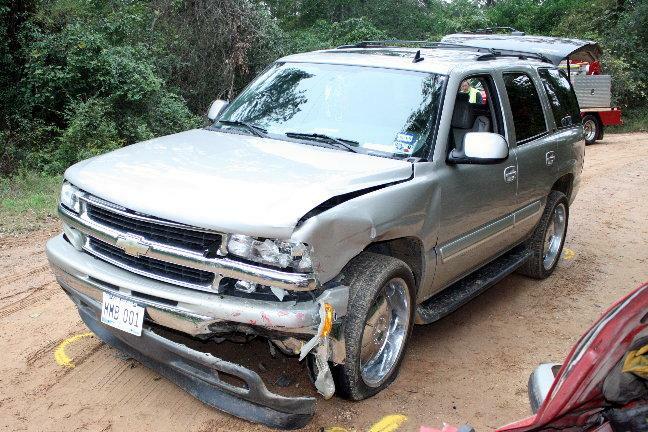 Major Accident Hospitalizes Woman and Small Child, SEGNO, October 10, 2009 - At approximately 4 pm on October 10, 2009 a tan 2006 Chevy Tahoe driven by Carrie Lambright, 23, of Livingston, was east-bound on Plum Pudding Road less than a mile off of FM-2798 in Segno. 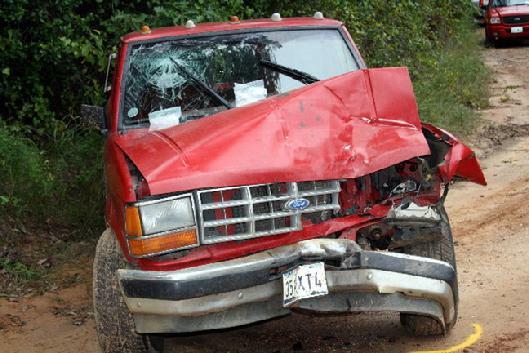 Lambright failed to share the road with an oncoming red 1990 Ford Ranger driven by Melissa Villanueva, 22, of Livingston. The accident occurred right where Plum Pudding road turns and Lambright apparently didn't see Villanueva coming. The vehicles collided damaging both vehicles. 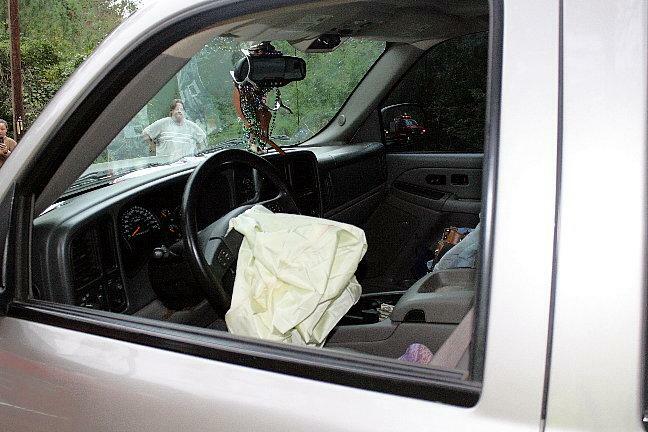 Villanueva had her mother and six year old son in her vehicle and her mother's head hit the windshield shattering the windshield of the small truck. Segno Volunteer Fire Department was dispatched to the scene along with Americare Ambulance Service and DPS Trooper Brent Henry. Villanueva's mother and son were both transported to Livingston Memorial Hospital with undisclosed injuries. Traffic on the rural road was slowed down but not blocked as the accident was being cleared. According to Trooper Henry, Lambright received a citation for failure to give half the roadway to oncoming traffic. Villanueva was issued a citation for driving with no driver's license. Both parties had insurance. A rollback wrecker from Harwood Wrecker Service recovered the totaled Ford Ranger and it will be stored at 101 Harwood Drive in Livingston. The scene was cleared by 6:15 pm. A word from Jim Harwood: If you are unfortunate enough to be involved in a car accident, whatever you do, please leave the keys in the ignition. 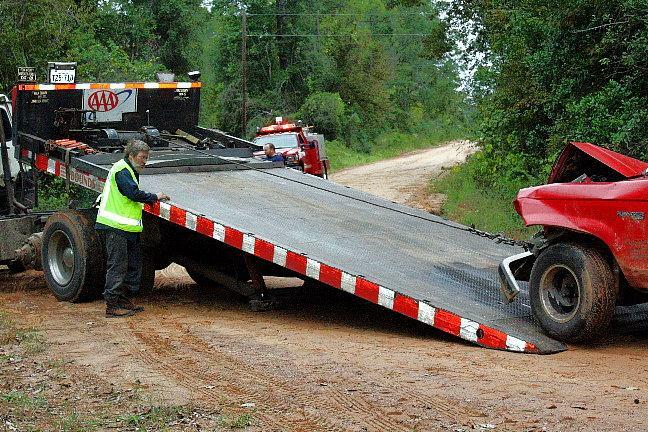 The vehicle recovery specialist will make sure your vehicle is recovered properly and securely taken care of. 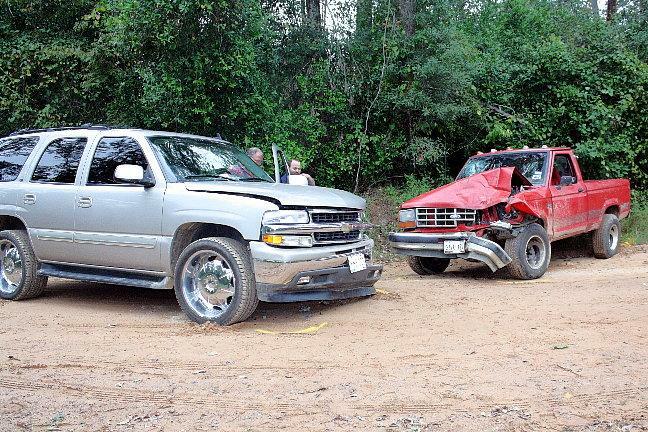 The vehicles collided where the road has a sharp curve. Carrie Lambright's vehicle was towed by a friend. Bits of glass pepper the interior of the Ford Ranger. 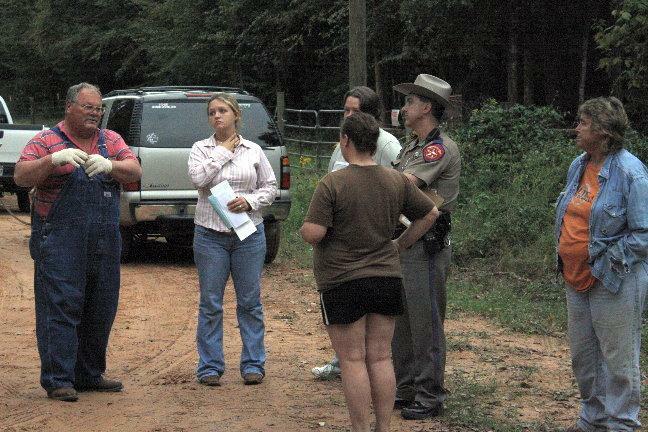 DPS Trooper Brent Henry speaks with people at the scene. One of Polk County's finest Vehicle Recovery Specialists, Jim Harwood.